I've had bacon for breakfast many times during my lifetime, but a recent weekend marks the first that it was covered in chocolate. 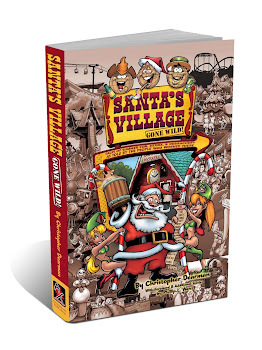 This surprisingly tasty concoction is just one of the many delicious handmade candy confections that can be found at Wisconsin Dells Swiss Maid Fudge, where I got to cross off something that has been on my Bucket List since I was a child. 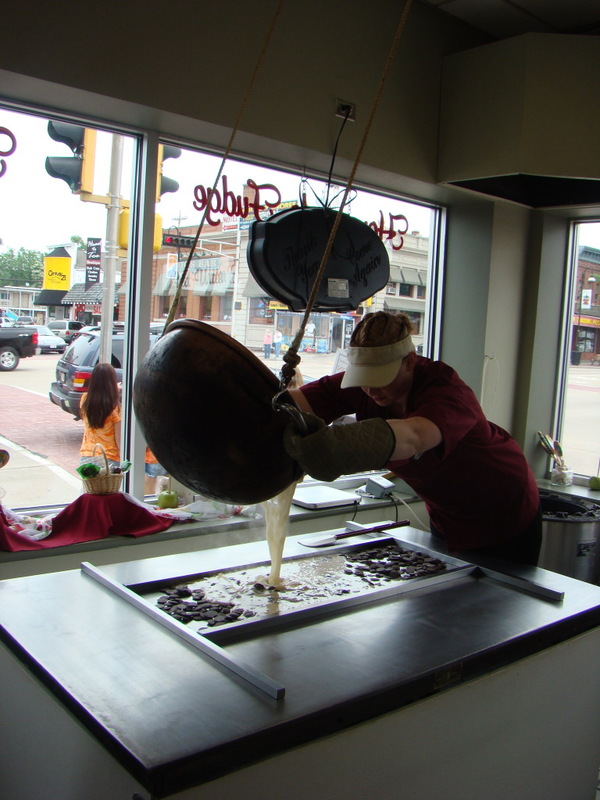 Getting the opportunity to make some of their world famous fudge – and taste all the delicious samples that went along with it. 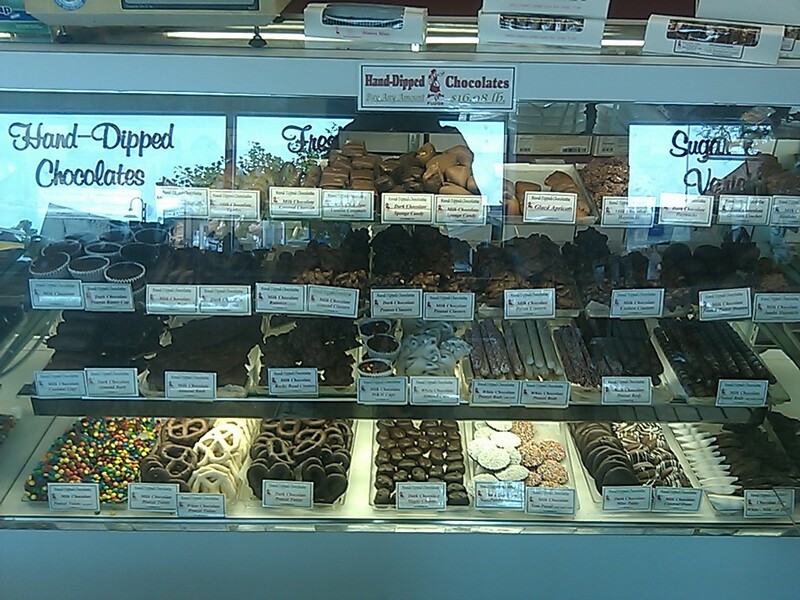 Swiss Maid Fudge first opened its doors in l962, and is a second generation old-fashioned candy store owned by Jane Heller. Jane, who started working in the business as a sales clerk when she was just 14 years old, has shelves and cases overflowing with candy made the old European way using copper kettles and cooked over cast iron stoves. Using natural ingredients like 100% Wisconsin Sweet Cream Butter, Heavy Cream, Pure chocolate and vanilla, Swiss Maid’s creamy fudge and other candies contain no artificial preservatives, bringing customers for nearly five decades the purest candy possible. Among Jane’s delectable delights are: Hand-dipped Chocolates, Salt Water Taffy, Caramel Apples, Caramel Corn, Brittles and Crunches along with her Buttery Homemade Caramel. 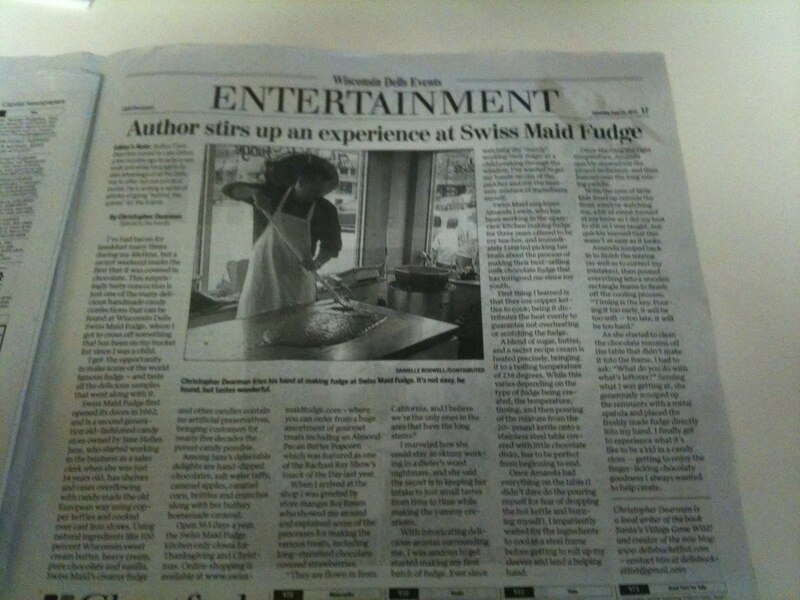 Open 363 days a year, the Swiss Maid Fudge kitchen only closes for Thanksgiving and Christmas. 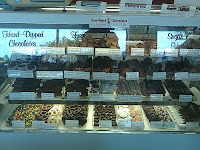 Online shopping is available at www.swissmaidfudge.com - where you can order from a huge assortment of gourmet treats including an Almond Pecan Butter Popcorn which was featured as one of the Rachael Ray Show’s Snack of the Day last year. 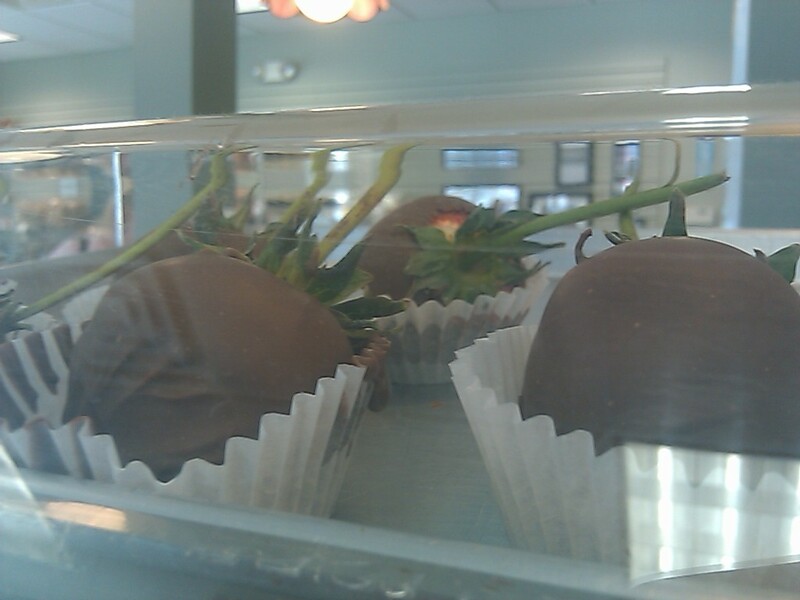 When I arrived at the shop I was greeted by store manager Roj Rosen who showed me around and explained some of the processes of making the various treats, including long-stemmed chocolate covered strawberries. "There flown in from California, and I believe we’re the only ones in the area that have the long stems.” I marveled how she could stay so skinny working in a dieter's worst nightmare, and she said the secret is to keeping her intake to just small tastes from time to time while making the yummy creations. With intoxicating delicious aromas surrounding me, I was anxious to get started making my first batch of fudge. Ever since watching the "maids" working their magic as a child peeking through the window, I've wanted to get my hands on one of the paddles and stir the heavenly mixture of ingredients myself. Swiss Maid employee Amanda Lewis, who has been working in the open-view kitchen making fudge for three years offered to be my teacher, and immediately I started picking her brain about the process of making their best-selling milk chocolate fudge that has intrigued me since my youth. First thing I learned is that they use copper kettles to cook; being it distributes the heat evenly to guarantee not overheating or scotching the fudge. A blend of sugar, butter, and a secret recipe cream is heated precisely, bringing it to a boiling temperature of 238 degrees. While this varies depending on the type of fudge being created, the temperature, timing, and then pouring of the mixture from the twenty pound kettle onto a stainless steel table covered with little chocolate disks, has to be perfect from beginning to end. Once Amanda had everything on the table (I didn't dare do the pouring myself for fear of dropping the hot kettle and burning myself), I impatiently waited for the ingredients to cool in a steel frame before getting to roll up my sleeves and lend a helping hand. Once reaching the right temperature, Amanda quickly showed me the proper technique, and then handed over the long mixing paddle. As she started to clean the chocolate remains off the table that didn't make it into the frame, I had to ask: "What do you do with what’s leftover?” Sensing what I was getting at, she generously scooped up the remnants with a metal spatula and placed the freshly made fudge directly into my hand. I finally got to experience what it’s like to be a kid in a candy store – getting to enjoy the finger-licking chocolaty goodness I always wanted to help create.